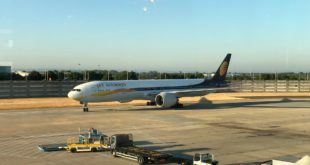 I had originally planned to fly Indigo to Singapore, but their flight timings are really inconvenient and the fare on Singapore airlines was double that of Jet on the days I wanted to fly. 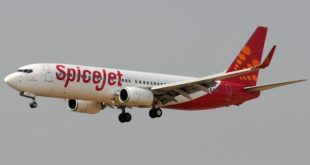 I have also been wanting to fly Jet on an international leg but due to non availability of award space or high fares on their flights it has never happened. On the day of the flight, I had left home with some extra time in case of delays on the road. It was good that I did since one of the main roads of Bangalore had been shut down without notice for relaying. Luckily I had left extra time and a really fast taxi driver which got me to the airport exactly two hours before the flight. The check in line at the dedicated counter for the Singapore flight was very long. Since I am entitled to use the premiere line, I got into that one. Check in was done in about five minutes. The agent told me that the flight was absolutely full when I asked if the seat next to mine was empty. After check in, I quickly went through immigration and was shortly at the plaza lounge for breakfast. I reached the gate at the time printed on the boarding pass. Boarding began about 10 minutes late and was called zone wise. 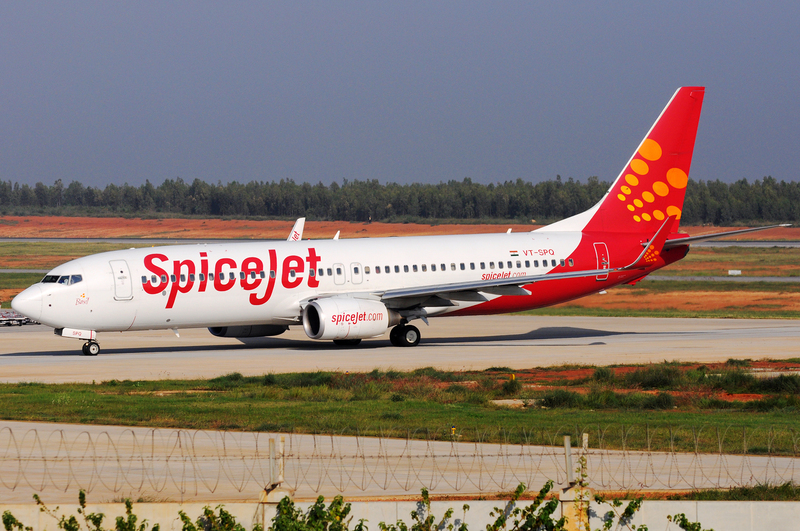 Bangalore Kempe Gowda International (BLR) to Singapore Changi (SIN). 9W 024. STD 11:10 STA 18:10. All times local. 10-Dec-17. VT-JGF. Boeing 737-800. Seat 11C. The line into the plane was moving very slowly as people stowed their luggage. When I reached my seat, I quickly stowed my bag and settled down. 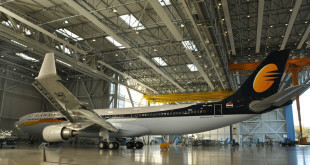 Jet Airways uses a standard 737 economy layout with a 3-3 arrangement and tight 17 inch seats. The seat is comfortable with just about adequate leg room. The seat also has adequate recline but requires the recline button to be pressed with super human strength. I saw many people complaining that the seat wouldn’t recline and the flight attendant pressing the buttons as hard as they could to get the seat to recline. Jet needs to improve the maintenance of their seats. 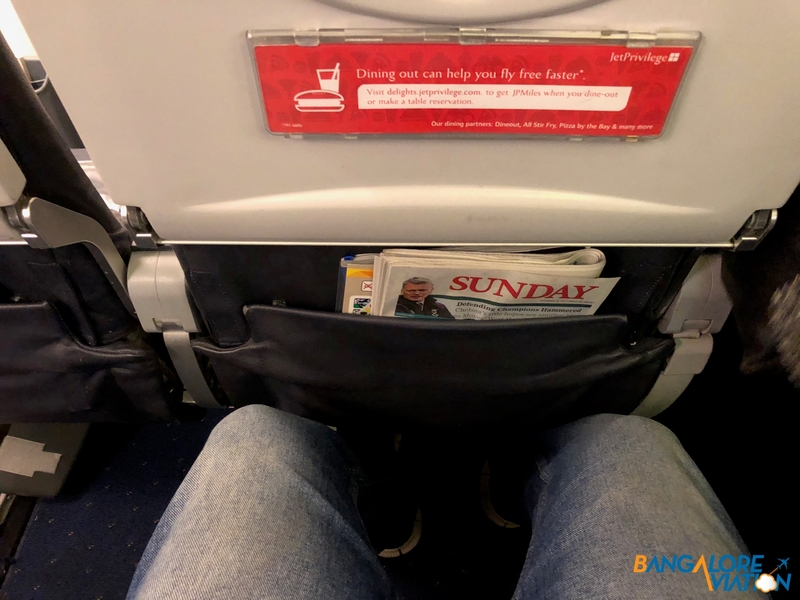 Leg room on Jet Airways’ 737-800. Seat back on Jet Airways’ 737-800. The aircraft pushed back exactly on schedule and we were quickly in the air. About 10 minutes after takeoff, the crew began a beverage service with a beverage cart. They had a variety of beer, basic spirits and a sauvignon blanc and merlot from CYT vineyards. I asked for a coke zero which they had. My coke zero and a snack packet. The front of the cabin had a big stickers which said JetScreen which I expected to be switched on after the flight took off. The aircraft has no IFE systems in the seat. I was waiting for the streaming to start so I could see what kind of content was available, however when I asked the flight attendant she said there was no JetScreen on that flight. So I just watched a movie on my iPad. The meal service began an hour and a half into the flight. There was a veg and non-veg option. I cannot recall ever having good or even decent food on Jet and this flight was no exception. 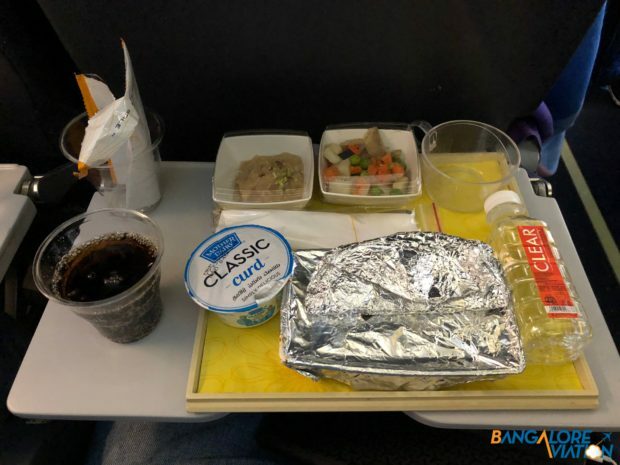 The salad was really soggy and tasted bad, the main was very bland but had good texture and I was ok with it but the guy across the aisle and the lady next to me were both told the air hostess that their meals were absolutely flavourless and the dessert had a weird powdery and oily taste. Overall let’s just say I returned my tray mostly uneaten. The meal as it is presented on the tray. 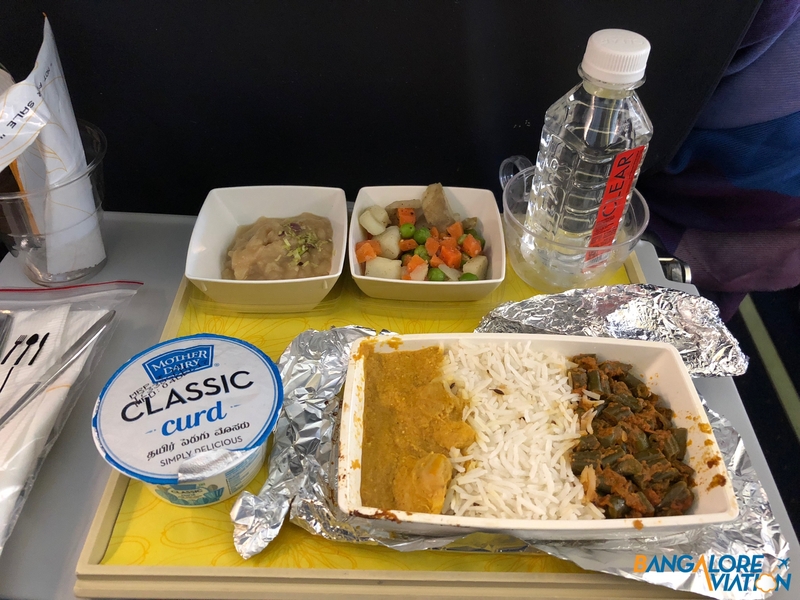 Meal on Jet Airways’ flight to Singapore. The flight had also run out of coke zero and diet coke after just the one round of drinks – so there was none during the meal service. While clearing the trays, the crew served coffee and tea. I liked this sticker which was on one of the bulkheads. I used to use one of these – still have it and it still works. The flight proceeded to Singapore normally however there was a lot of turbulence on the way with the seatbelt signs being on most of the way. We reached Singapore 25 minutes before schedule and began circling. We then circled for the next 45 minutes and landed 20 minutes late. We reached a gate pretty quick and disembarked. As usual at Singapore I was quickly through immigration and my bag was already on the belt. My flight on Jet was efficient. Service was warm and fast. However aside from a convenient flight timing – I don’t see what the airline offers over an LCC like Indigo. The airline offers no IFE, the food is terrible (at least on a LCC, I could have picked what I wanted to eat) and Jet’s prices for blocking seats especially the emergency rows is very high. 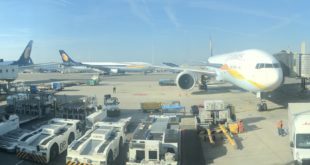 Indigo has been offering very competitive fares to Singapore from Bangalore – if you can live with the annoying flight timings and get a good fare – I don’t see what Jet is offering in service except a drink service which differentiates it from the LCC. 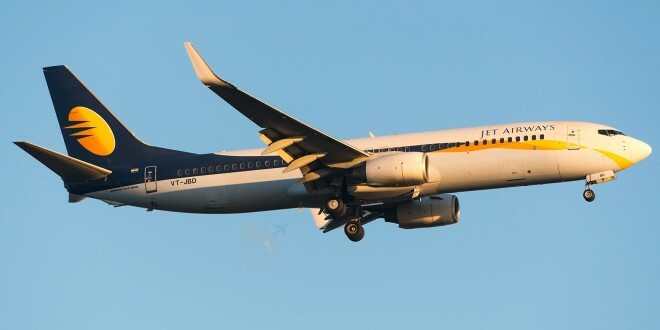 I only see this flight as useful for Jet Privilege members – unfortunately even though Jet has been aggressively promoting it’s membership program, the airline doesn’t offer a status match either – so for elite members of other programs like me the airline has made it very difficult to shift loyalties.